I was approached by Joyce Backhouse in 2012, who asked if I would be interested in doing a commission based on some of the concrete sculptures her grandfather Frederick (Fred) Cowling had done. 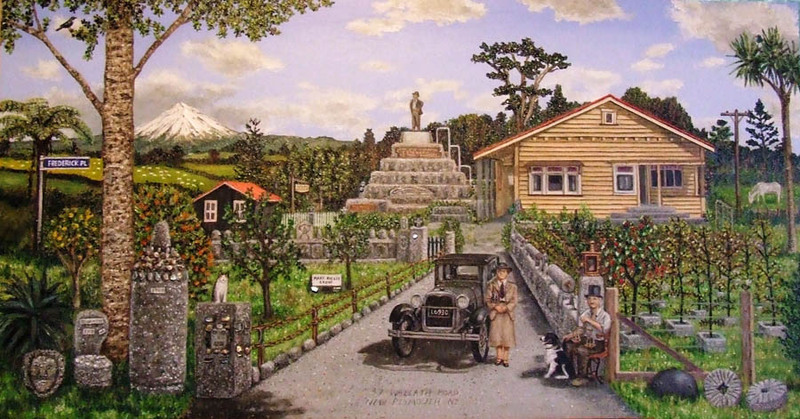 Joyce was prompted to get a painting done, as the pyramid which her grandfather had built to look out over his Kauri plantation and property had been demolished, and she wanted a painting done which would depict the pyramid, part of the original house (which the pyramid was attached to), and the existing sculptures and chain link fence still on-site. What ensued was a three year journey of site and museum visits, many communications and a very challenging painting project which resulted in painting the life story of Fred and Mary, with many elements of their times living on Roto Street (previously Wallath Road - known by some at the time as “curiosity corner”), with a lot more content than the original conversation! I am very pleased that Joyce was happy with the final result, and feel like I got to know Fred and Mary during the painting process. Joanne lives and works in Taranaki.